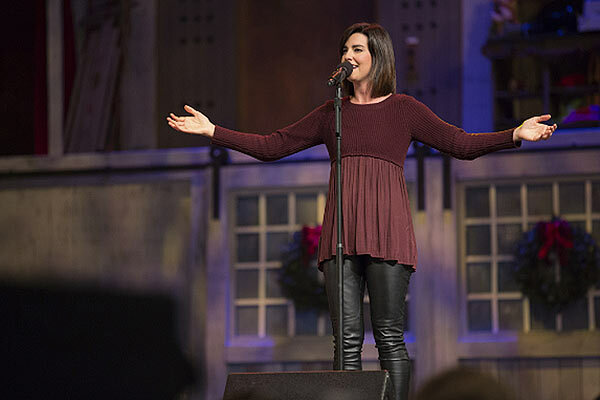 NASHVILLE, TENN. - 13 December, 2016 - Word Worship artist Meredith Andrews is set to appear on The Todd Starnes Christmas Show December 24 and 25 on FoxNews.com. This annual Christmas show was taped live at Bellevue Baptist Church in Memphis, TN on Tuesday, December 6. The program will air at 6:30 PM CT on hundreds of Fox Radio, American Family Radio and Bott Radio stations. This two-hour Christmas celebration will focus on the birth of Jesus Christ with additional special musical guests Jason Crabb, The Mylon Hayes Family, the cast of the Singing Christmas Tree and one of the best orchestras in America. For more information, please click here. Earlier this year, Andrews released Deeper, which features the songs "Soar," "Lamb of God," "Deeper," and "Spirit of The Living God." The album can be purchased on iTunes here. Recently, Andrews partnered with co-founder of Saddleback Church and best-selling author Kay Warren in a video series titled "Meredith Andrews + Kay Warren: Deeper." The five-video series includes: Deeper Ministry, Deeper Worship, Deeper Family, Deeper Brokenness and Deeper Living. The video series can be viewed here. Be sure to visit her website for the latest information as well as her latest touring schedule. ABOUT MEREDITH ANDREWS: Word Worship recording artist Meredith Andrews is passionate about writing and leading songs that keep people's hearts and minds set on Jesus. Over the course of her three Word Worship albums, the Dove Award-winning artist has been using her musical gifts, love for God, and her huge heart for His people - to teach and remind us all about the enormity of our awesome and loving Savior. Andrews focuses on creating music that lifts the body of Christ to a closer relationship with the Lord. On a regular basis, Andrews leads worship at major women’s and worship leader conferences across the U.S., and has toured with Matt Maher, Natalie Grant, Big Daddy Weave, Vertical Church, Phil Wickham, and Michael W. Smith, among others. Andrews is married to Jacob and has three children: Maverick, Remy and Frankie. For more information, please visit MeredithAndrews.com. For more info on Meredith Andrews visit the JFH Artists Database.